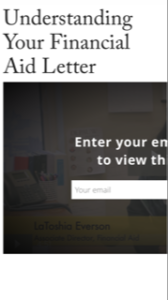 How easy is to understand a financial aid award letter? Do higher education professionals even acknowledge that it might be especially confusing for “first time in college” folk who have never seen one before? For this Link of the Week selection we first went in search of “guide to financial aid award letters.” With an exception noted below, that was not fruitful. Most “guides” found in the first 5 pages of search results were from third party sources. When we changed the search to “understanding your financial aid award letters” results were better, although still few in number. We didn’t count the frequent PDF results. Aside from the general problem with forcing people to open PDFs, most violated the “don’t make me squint” rule with small fonts and crowded content. Using a PDF says that you don’t think the information is important enough to prepare as real web content. Mistake. We did find examples worth noting here to expand from our usual single Link of the Week. A video explanation from the associate director of financial aid at DePauw University, LaToshia Everson, uses language that anyone outside a financial aid office can understand. One odd note: As the page opens, there is a stark request to enter an email address to view the video. Glance to the lower right and you’ll see a “skip” button. That’s what we did. The page did not play well on my iPhone as you can see from the image here. Best visited on laptop or desktop computer. We found other sites worth a visit at colleges and universities that seem to acknowledge that a financial aid award letter is not something that every “normal human being” outside a financial aid office will immediately understand. “Understanding Your Financial Aid Letter” gets a “Good” 5 second mobile download speed rating from Google Test My site, with an estimated visitor loss of 19 percent. Join 624 people on the Top Tasks: Higher Education Website Content group on LinkedIn.